U.S. stocks and the dollar rose as markets weighed the lack of any real progress on the euro-zone crisis against an unexpected rise in the U.S. services sector, as measured by an index from the Institute for Supply Management. The Dow Jones Industrial Average /quotes/zigman/627449 DJIA broke a four-day losing streak, rising 26 points, or 0.2%, to 12,128. The S&P 500 Index /quotes/zigman/3870025 SPX added 7 points, or 0.6%, to 1,286. Yields on 10-year Treasury notes /quotes/zigman/4868283/delayed 10_YEAR , which move inversely to prices, rose 4 basis points to 1.57%, rising a second day from record lows. The euro retreated against the dollar, staying down after a Group of Seven teleconference yielded no concrete proposals to tackle Europe’s sovereign debt and banking crisis, with Spain in particular. The shared currency /quotes/zigman/4867933/sampled EURUSD fell back towards an almost two-year low, buying $1.2453, from $1.2493 in North American trade late Monday. Oil futures settled at $84.29 a barrel, up 31 cents, or 0.4%, while gold /quotes/zigman/676896 GCQ2 rose $3, or 0.2%, to settle at $1,616.90 an ounce. Asian stocks gained for a second day and oil climbed, while the Australian dollar rallied after the country’s economy grew at twice the rate economists estimated and a gauge of U.S. services industries increased. Aluminum rose as metals in London resumed trading after a holiday. The MSCI Asia Pacific Index (MXAP) added 1.1 percent at 12:55 p.m. in Tokyo. The Nikkei 225 Stock Average climbed 1.6 percent. Standard & Poor’s 500 Index futures advanced 0.7 percent. The so-called Aussie strengthened 1.2 percent against the U.S. dollar, poised for the biggest gain in almost two months. The euro rose 0.4 percent against the greenback. Oil advanced 0.9 percent in New York, while aluminum increased 0.7 percent. Australia’s gross domestic product advanced 1.3 percent in the last quarter from the previous three months, a Bureau of Statistics report showed, compared with the median 0.6 percent gain predicted by economists in a Bloomberg News survey. U.S. service industries sustained their pace of growth in May, showing the biggest part of the U.S. economy is withstanding the impact of the European debt crisis. The Group of Seven nations yesterday agreed to coordinate their response to Europe’s turmoil, which has tipped at least eight of the 17 euro-area economies into recession. European representatives “said they will speed up their efforts to resolve those problems, which was encouraging to us,” Japanese Finance Minister Jun Azumi told reporters in Tokyo. The European Central Bank will leave the benchmark rate at 1 percent today, according to 32 of 44 economists surveyed by Bloomberg News. Asian currencies rose the most in eight weeks. Malaysia’s ringgit climbed 0.8 percent to 3.1760 per dollar, the Thai baht strengthened 0.5 percent to 31.47 and the Philippine peso added 0.6 percent to 43.29. The Bloomberg-JPMorgan Asia Dollar Index strengthened 0.2 percent, the most since April. The gauge lost 2.8 percent in May in its worst drop since September. The Institute for Supply Management’s index of non- manufacturing businesses, which covers about 90 percent of the world’s largest economy, increased to 53.7, topping the median projection of economists for a reading of 53.4. Country Garden Holdings Co. climbed 6.5 percent, pacing gains by Chinese developers in Hong Kong, after Deutsche Bank AG said the nation’s home sales in May probably reached the highest value since last June. China should cut interest rates at an “appropriate time” to avoid a deep growth slump, the state-run China Securities Journal said in a front-page commentary today. Commerzbank AG, Germany’s second-largest bank, had its credit rating cut one level today as Europe’s debt crisis prompted Moody’s Investors Service to downgrade seven lenders in the nation and three in Austria. Commerzbank, based in Frankfurt, was reduced to A3 from A2, Moody’s said in a statement. A review of Deutsche Bank, the nation’s largest lender, will be concluded later, Moody’s said. Oil for July delivery rose to $84.96 a barrel, a third day of gains. Inventories fell 1.8 million barrels last week, the industry-funded American Petroleum Institute said after yesterday’s close. Three-month delivery aluminum climbed to $1,986 a metric ton on the London Metal Exchange. The LME reopened after two days of holidays. The cost of insuring Asia-Pacific corporate and sovereign bonds from default decreased, according to traders of credit- default swaps. The Markit iTraxx Asia index of 40 investment- grade borrowers outside of Japan declined three basis points to 202, on course for the lowest close since May 31, according to Credit Agricole and CMA prices. TORONTO — The Toronto stock market registered a solid advance as resource stocks rebounded Tuesday morning after a string of losses amid global economic uncertainty. The S&P/TSX composite index jumped 116.89 points to 11,452.67 while the TSX Venture Exchange gained 10.77 points to 1,289.31. The Canadian dollar gave up early gains to dip 0.03 of a cent to 96.15 cents US as the Bank of Canada said that it was leaving its key interest rate unchanged at one per cent because of a worsening economic environment. It also kept the door open for future rate hikes. New York markets were slightly higher. The Dow Jones industrial average was up 4.69 points to 12,106.15. The Nasdaq composite index added 8.2 points to 2,768.21 and the S&P 500 index was up 3.44 points to 1,281.62. The gains in New York came as the latest reading on the U.S. services sector showed continued expansion. The Institute for Supply Management’s index came in at 53.7, up from 53.5 in April. Finance ministers and central bank governors from seven of the world’s main economies are grappling with Europe’s shaky economic situation and were to hold a conference call Tuesday to discuss a response. The G7 teleconference was being held as Spain’s banking crisis continued to cast a shadow over trading. The country’s banks are weighed by toxic loans following the implosion of the country’s real estate sector in the wake of the 2008 financial collapse. Those banks may force the country to seek a bailout. Spain, strapped for cash, might have to tap European Union rescue funds, but it is reluctant to do so because such aid would come with strict conditions. Spain has been forced to pay ever higher amounts of interest to attract buyers for its debt with the yield on the country’s 10-year bond up 0.02 of a point to 6.42%. Spanish Treasury Minister Cristobal Montoro said Tuesday said that, given current borrowing costs, financial markets had effectively shut out the country. He also claimed the amount of money needed to prop up Spain’s troubled banking sector is not excessively high but said the question was where the money would come from. And he repeated the country’s calls for the European Union to move faster towards establishing a banking union that would allow ailing lenders to seek help without governments intervening. Banca Santander S.A. chief Emilo Botin’s estimate that Spain’s banks would need C40 billion to shore up their defences. Canada’s finance minister, Jim Flaherty, has said European Union governments have significant resources and should be able to handle the eurozone’s problems without outside financial assistance from other countries. However, Flaherty said Monday that he was concerned about the European situation and said Ottawa was prepared to take measures to cushion Canada’s economy if the situation arises, much as it did during the 2008-9 recession. “One of the real issues that investors are wrestling with is that people have lost confidence in the ability of the Europeans to deal with the problem (of recapitalizing their banking system),” said Norman Raschkowan, North American strategist for Mackenzie Financial Corp., adding the problems in the banking sector don’t end at the Spanish border. The energy sector was up 1.8% as oil oscillated between slight gains and losses during the session. At late morning, the July crude contract on the New York Mercantile Exchange was off a dime to US$83.88 a barrel. Suncor Energy (TSX:SU) ahead 44 cents to $28.15 while Cenovus Energy (TSX:CVE) advanced 35 cents to $30.87. The base metals sector was ahead 1.15 per cent while copper prices dipped a penny at US$3.30 a pound. Teck Resources (TSX:TCK.B) climbed 77 cents to $31.26 and Ivanhoe Mines (TSX:IVN) climbed 23 cents to $9.91. The resource sectors have racked up the steepest losses on the TSX, which is down more than 11 per cent from its 2012 highs from late February. The financial sector was up one per cent with TD Bank (TSX:TD) ahead $1.13 to $77.63. Utilities were also higher as TransCanada Corp. (TSX:TRP) said it has been chosen by Shell Canada Ltd. to build, own and operate a $4-billion natural gas pipeline in British Columbia. The Calgary-based company said the pipeline will transport natural gas from the Montney region in eastern British Columbia to a liquefied natural gas export facility near Kitimat, B.C. Its shares gained 40 cents to $42.55. The gold sector was ahead 0.3% as bullion prices improved, up $6.80 to US$1,620.70 an ounce. Iamgold Corp. (TSX:IMG) gained 25 cents to $12.39. In Europe, London markets were closed as part of the Diamond Jubilee holiday while bourses on the continent were mixed as a European business survey sounded a dismal note Tuesday. Markit’s Purchasing Managers’ Index for the eurozone hit a near-three-year low in May. Even Germany was below the 50 mark, which indicates a contraction. Frankfurt’s DAX declined 0.33% while the Paris CAC 40 gained 1.28%. In other corporate news, Westport Innovations Inc. (TSX:WPT) has teamed up with global giant Caterpillar Inc. to co-develop natural gas technology to fuel off-road heavy equipment that typically use diesel. Caterpillar will fund the development program and Westport, a Vancouver-based specialist in engine technology, expects to supply key components for products developed under the initiative. Westport shares jumped $3.95 or 17 per cent to $27.10. Belden Inc. (NYSE:BDC) has made a friendly takeover offer for Montreal-based Miranda Technologies Inc. (TSX:MT), which makes high-performance hardware and software for the television industry. Belden’s offer of $17 per share cash values Miranda at about $371.5-million. Miranda’s share price jumped 62% to $16.87. Stocks tacked on gains Tuesday, but low volume suggested that big money stayed on the sidelines. The Nasdaq advanced 0.7%, while the S&P 500 and the NYSE composite each added 0.6%. The Dow Jones industrial average edged up 0.2%. The Philadelphia semiconductor index jumped 2.2%. Volume fell on both major exchanges, according to unconfirmed figures. The iPath Dow Jones Copper Subindex (JJC) dropped 1%. The copper ETF has been in a rolling downtrend since February 2011. Copper price is said to have a Ph.D. in economics because it often acts as an economic bellwether. Financials did best on the S&P 100 with Morgan Stanley (MS) jumping 4%, though volume was below average. Top-rated stocks were mostly up as stocks in the IBD 50 rose by a 5-2 ratio. Moves in big volume, though, were scarce. Dollar General (DG) attracted 173% greater volume as the stock lost 3.5%. The company reported better-than-expected results late Monday but a secondary offering appeared to dampen the enthusiasm. The stock lost its 50-day line. On the Big Cap 20, which only has 17 members this week because of weakness, Walt Disney (DIS) rose 1% in a fifth faster volume. The stock broke out May 9, clearing a 44.60 buy point in a square box base. The stock is less than 1% above the buy point. Upscale retailer Lululemon Athletica (LULU) gained almost 2% in volume that was 26% above average. The stock is still under its 50-day line. Among industry groups, fertilizers did best and retail wholesale building products were weakest. On Wednesday, the Federal Reserve is expected to release its beige book survey of economic conditions throughout the nation. Before the open, the latest readings on productivity and costs are due out. Stocks rose, while Treasuries retreated, as an increase in US service-industry growth tempered concern the largest economy was slowing and a report said Europe's bailout fund was preparing a credit line for Spain. The yen fell as Japan's finance minister said he's concerned about the currency's rise. The Standard & Poor's 500 Index advanced 0.5 per cent to 1,284.7 at 3:22 p.m. in New York after earlier dipping to its lowest level since January. Treasury yields rose for a second day on speculation their slide to record lows last week won't be sustained. The euro depreciated 0.4 per cent to $US1.2447 while the yen weakened against 14 of 16 major peers. Cocoa, silver and sugar led gains in commodities while oil was little changed. The Institute for Supply Management's index of non- manufacturing businesses, which covers about 90 per cent of the economy, increased to 53.7, topping the median projection of economists for a reading of 53.4. Spain may receive a precautionary credit line from the European Financial Stability Facility, Germany's Die Welt newspaper reported in a preview of a story that will run tomorrow, citing unidentified people familiar with talks about the possible option. "I'd be a buyer of stocks," John Manley, chief equity strategist for Wells Fargo Advantage Funds in New York, said in a telephone interview. His firm oversees $US205 billion. "The US economy is doing OK. Obviously there are lots of things that could go wrong. We're going to have to see more agreements in Europe. Yet valuation is attractive, the market is cheap." The S&P 500 reversed losses yesterday as the lowest price- to-earnings multiple in six months overshadowed a drop in factory orders. The index started the week trading at 12.9 times its companies' reported earnings, the cheapest since November. The index dropped 9.9 per cent from a four-year high in April through last week as US economic data trailed estimates while concern grew about Greece's future in the euro and Spain's deteriorating national finances. Financial, commodity and technology shares, the groups that led the S&P 500's retreat since April, were among the industries with the biggest gains today. JPMorgan Chase & Co., Bank of America Corp. and Hewlett-Packard Co. rose more than 2.5 per cent to lead the Dow Jones Industrial Average higher. A gauge of homebuilders in S&P indexes rallied 4.2 per cent as Lennar Corp. and PulteGroup Inc. surged more than 5 per cent. Facebook Inc. retreated 3.5 per cent, extending its decline since the company's initial public offering last month to more than 30 per cent. While the S&P 500 is likely to be supported at 1,250, further losses may extend its drop from an April peak to 15 per cent in a "selling climax" that would deplete bears, according to StockCharts.com Inc.'s Arthur Hill. A "new cyclical bear market appears in place" and investors should take defensive positions, technical analyst Louise Yamada said in a report. She added that more efforts by the Federal Reserve to boost growth may stop the S&P 500 from reaching the bear market threshold, commonly defined as a drop of 20 per cent from a recent peak. John Stoltzfus, chief market strategist at Oppenheimer & Co. in New York, said that while the S&P 500 may slip as much as another 5 per cent, he's sticking with his forecast that it will reach 1,450 by the end of the year. The estimate implies a 13 per cent rally from yesterday's close. "What will get us to 1,450 is we'll get some better economic news as the summer comes across, we'll get some kind of resolution in Europe, at least interim, related to Greece," he told Bloomberg Television's "InsideTrack" program today. "In addition to that," he said, "we'll find out that China is indeed headed to a soft landing rather than a hard landing." The euro slid against 12 of 16 major peers, with the currencies of Brazil and South Africa rallying more than 1 per cent. The Dollar Index, which tracks the US currency against those of six trading partners, climbed 0.3 per cent to 82.834. The index had fallen for two days after last week climbing to the highest level since August 2010. The euro slumped as a Markit Economics gauge of the region's manufacturing and services industries shrank the most in almost three years and Spain's budget minister called for outside help for banks as Europe's debt crisis remained in focus. Finance ministers and central bank governors from the world's leading economies agreed to coordinate their response to Europe's financial crisis on a Group of Seven nations conference call that dealt with Spain and Greece. The yield on the two-year German note hovered near zero after falling to minus 0.012 per cent at the end of last week. The yield on the Italian 10-year bond declined two basis points to 5.64 per cent, erasing an earlier increase. Ten-year US Treasury note rates, which slid to a record below 1.44 per cent last week, rose four basis points to 1.56 per cent today. The Stoxx Europe 600 Index added 0.3 per cent, rebounding from its lowest level since Dec. 19. Spanish stocks rose for a second day after short interest fell in the biggest traded company and the City of London, home to many hedge funds, shut down to celebrate Queen Elizabeth II's Diamond Jubilee. Spain's Ibex-35 rose as much as 0.5 per cent after yesterday rallying 2.9 per cent in a rebound from a nine-year low. Yesterday was also a U.K. holiday. Short interest in Telefonica SA, Spain's largest company by market value, fell to about 2.1 per cent of outstanding shares on June 1, the latest day for which data is available and the lowest level in almost six weeks. Short interest in Bankia, the lender that requested a 23.5 billion-euro bailout last month, dropped to two-month low of 2.5 per cent on June 1, the last trading day before the four-day holiday. The MSCI Emerging Markets Index added 0.5 per cent, rebounding from a six-month low. Benchmark gauges in South Korea, Indonesia and Taiwan climbed more than 1 per cent. The Shanghai Composite index gained 0.2 per cent, while Russia's Micex Index fell 0.8 per cent. After 11 weeks of losses sent stocks in emerging markets to the brink of a bear market, dealers have started cutting prices of contracts to protect against declines. Puts priced 10 per cent below the iShares MSCI Emerging Markets Index Fund cost 1.34 times calls betting on a 10 per cent gain, down from 1.49 times on May 1, according to data compiled by Bloomberg. The price relationship known as skew for the security, which tracks companies such as Suwon, South Korea- based Samsung Electronics Co. and China Mobile Ltd. in Hong Kong, touched its lowest level since January yesterday. As one of Hollywood's hottest young starlets Emma Roberts certainly has some cash to splash. So the 21-year-old did just that when she teamed up with her close pal, photographer Tyler Shields, for his latest photo shoot. Roberts can be seen getting creative with a wad of money as she poses in a series of seductive poses. The Virginia actress looks stunning wearing just a black strapless jumpsuit and lashings of scarlet lipstick, tying her caramel locks off her naturally pretty face. She fans herself and even bites into a stack of 100 dollar bills, all before casually throwing the money into the air and watching it fall like rain around her. One of the photographs from the alluring photo shoot was used as the cover image for Shields' latest book, Richest Man - a prequel to his first novel, Smartest Man. 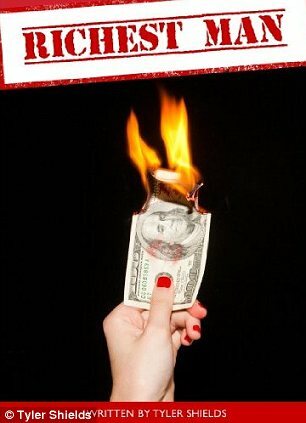 However the cover is likely to land Shields in even more hot water as it sees Roberts holding a 100 dollar bill which has been lit on fire. The photographer has come under attack after he destroyed a $100,000 Hermes Birkin bag and snapped pictures of the process for his art. Both Shields and his girlfriend Francesca Eastwood, who appeared in the photos, have received abusive messages over the internet since the venture. The destruction of the designer accessory was shown on the 19-year-old's family's E! reality TV show, Mrs Eastwood and Company. But while depicting that he quite literally has money to burn has caused a backlash, the toast of Tinseltown are still lining up around the block to work with the photographer. Shields is famed for his creative and controversial shoots with the likes of Lindsay Lohan, Mischa Barton, Demi Lovato, and members of the casts of Glee and Revenge. Richest Man by Tyler Shields is available on Amazon now.